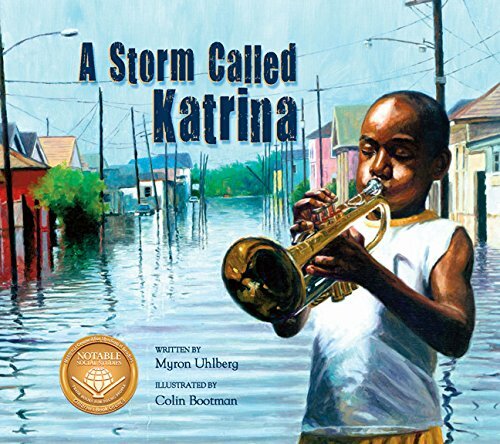 A Storm Called Katrina is one young boy’s experiences when Hurricane Katrina brought death and destruction to Louisiana in 2005. Though this picture book is considered to be fictional, it tells a story based on true events. It also embodies a pure style of jazz and blues music that New Orleans is best known for. It expresses uncertainty and looming danger, inspires hope, and supports the idea that home truly is where the heart is. Louis Daniel Armstrong, a ten-year-old cornet player, does not like to be addressed by his mother as “Baby” because he is not that little anymore. When the storm hits and he and his parents are forced out of their home by the rising floodwaters, his mother’s term of endearment becomes one that is soothing, protecting, and encouraging. The floodwaters carry away everything. There is uncertainty and looming danger in the aftermath of the storm. As a little dog floats by, so does Louis’s sense of safety and protection. Danger looms in the water and so does death. Even when it seems that safety has arrived as they approach the Superdome, shortages of food and water threaten their safety. Louis’s father separates himself from his family in search of food and water. Fear breeds greed and danger, and Louis sees it firsthand. How will his father find them among thousands? Louis’s creative thinking amid the chaos in the Superdome is inspirational. The illustrations for this specific moment in time further evoke this sense of hope and an enduring connection between the residents and the city that they call home. Though thousands of residents left New Orleans to start over, there were thousands of others who remained in the city. The ending of this story and the information provided in the author’s note support the idea that home is truly where the heart is. The author’s note provides the nonfictional story of Hurricane Katrina and the historic background of New Orleans as an added benefit for readers. In terms of its format, this picture book needs a larger font size in the text. While the illustrations sufficiently tell the story, the text is equally important. The text size is not large enough for readers in the targeted age group nor for adult readers who might be engaged by the story with their children. Readers may frequently strain to read the text, causing them to focus less on the pictures that are the intended focus of the story. Electronic reading devices may compensate for this flaw, though it is likely that the illustrations cannot be seen in their entirety once the text is magnified sufficiently. The illustration for the cover of this book suggests a much darker story, which could cause readers to feel deceived. The cover illustration does not appear part of the story itself, which could also be a contributing factor in how the story is perceived by the reader. The illustration on page ten contains some elements that match the cover illustration, but there are not enough similarities between them to align the cover with the story. The illustration on page ten may be the best choice for the cover with minor artistic adjustments. Janette M. Denil, MATC, is an Illinois and Wisconsin Professional Educator in Language Arts and Social Studies.